What an idea to come here! And for what? Probably nothing… But well, she decided to come here after all. She thought that here, it could be a little bit dangerous, but, as she said, a presentiment is probably one of the most important thing to follow. So, as always, she decided to take part of a new adventure, in a strange place named “Gagazet Mountain”, as she read on a panel in wooden. With her, she took all that can save her, even if she hadn’t got many objects. So, she had her flute, a strange bottle with water, and a potion, of course. It was not large thing, but finally, it was largely sufficient. If we looked at only at a glance, we could think that the mountain was simple to climb. The way would be traced, there would be just to follow it. Admittedly, there would be many enemies, but except for that, this climbing would be simple. So, Eiko was then put to leave in the direction of the top, trustful and smiling. In the beginning, nothing to very hard. She dodged two enemies who seemed more attracted by an edible animal than by the little girl. She continued to climb as high as she can… then, she stopped, open her little bag to take something to eat…. She looked her bag falling from the mountain, with her water bottle… Lowered head, Eiko decided to climb the mountain from where she was. She was so hungry that it was not really easily. After several hours, she finally arrived in a beautiful place. She never thought that a place like this exists at the top of a mountain, but this world is full of surprises! Gagazet Mountain...it's far away the time where the Guado comes here for stopped the summoner and killed Ronso. Even for Seymour who as killed at this place, it's a true chance to can come here for breath the pure oxygen and watching the wonderful view. Seymour can fly sine he died but he prefer walked for the pleasure of touch the ground of his foots. He stopped his excursion for a little moment and closed his eyes. Yes, the great Seymour like that but he's not here for that and walk again go where the way to guide him without look out where this is drives him. Why? Probably because he knows even not what to doing. This beautiful place was an pilgrimage way for the summoner who acquire the last Eons. It's stupid to do this when the secrets of this is revealed. It's better to be the ultimate Eons rather than invoke him. Well, it's time to going in research of the power. The monster in area stood far of Seymour. Maybe because the perfume of fair plane scream them. But the man see a little girl. She was so little, it's really surprising when we see that. In spite of the wind the girl hear the movement of the guado who is more tall than she. Seymour stood in the shadows of the mount waiting an action to the person who is alone. This too strange that she was alone in Gagazet. Go in this place is not good idea when we not prepared to come here. The sun was high in the sky but it was cold, very cold... What will happen? Don't worry, you will know that in few time. Excusez-moi de la très mauvaise qualité de mon anglais et de la petitesse de mon rp. « It's freezing cold ». That's what she could have thought. Despite of the especially cold winter (and furthermore going to such a place as the Gagazet Mountain), she was just wearing a baby-blue dress with some white coat on, and then walking as she didn't feel anything. Actually, she didn't feel anything : the cold of her iced face was truely nothing if only we'd known her stonned heart. Her aim was to get back to the mist Island, even though he was pretty far from her "sweet home". Then one would ask if it wouldn't have been quicker to take a chocobo or something else. The thing is her own one escaped during a fight, and she was left to walk by this weather. Well, a walk in the land could just be welcomed. Heading south, she nevertheless began to feel tried, even the Queen gets exhausted, and that's the reason why she decided to stop by to take a rest. She wasn't in a hurry anyway, she had plenty of time. But have you ever seen some house in those mountains? People have to be crazy to work at a place like this one, almost no customers, work conditions like hell, all alone.. How sad. Well guess what Kaori did then? She just sat on the flood and took some bread from her bag. That was the moment when she heard noise in her back. She swung round, and went slowly near the noise source.. discovering a weird guy staring at a weird girl. Wow, it was the first time she had seen a ..
Too straightforward. She couldn't stay silent, when she had something to say, she just couldn't hold it. And that made her having lot of problems, and above all, that strange guy looked not really friendly.. It wasn't her lucky day. Gosh, what time was it now? How long had he been wondering in those woods? Actually he could tell by the bitter feeling in his stomach. At the very least, it had been five hours; he was starving. Well not literally starving, but he was damn hungry. He had somehow managed to make some money since he arrived in this strange world, but there was nothing here, not any place where he could buy food. 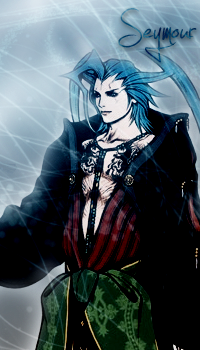 He sighed, slightly annoyed by his own stupidity. Why didn't he bring food along was a real good question; the answer being that he had been, like he always was, thoughtless. He could have used the Corridors of Darkness, but he preferred not too, since he couldn't foresee the place where he would appear. Last time he did that, he found himself facing a very unsympathetic monster. Anyway. Here he was, on a mountain -of which he didn't even know the name-, playing some melodies of his own invention on Arpeggio, singing along. Until he eventually start hearing voices. There were people up there! 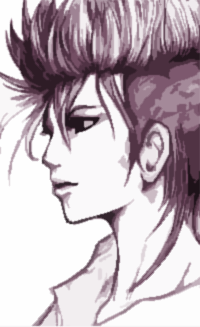 Demyx quickly made his sitar disappear and hesitated. Did they hear him just now? Cause if it was the case, there was no need for him to make a discreet approach. Well, he couldn't really take the risk, as far as his experience went, he'd have to be careful, since he wasn't exactly the tough type. The simili silently crossed the last meters, hiding behind the bushes. Eiko, sat on the floor, was looking at this strange place. It was really different of all that she saw before… Well, not really in fact… This place reminded her The Water Sanctuary. Why? She doesn’t know really why, but well, this not a real problem. While she was searching something which helped her to understand why she was here, a man came, behind her, without say something. Then, a girl… well, rather a woman looked at the man and told him that she should hit people like him… Well, what does he want to Eiko? The little girl turned and got up in front of the two persons. -But, who are you? And you, big guy, what do you want of me? !